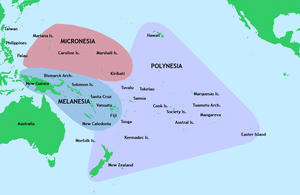 Polynesia ( UK: /ˌpɒlɪˈniːziə/, US: /-ʒə/; from Greek: πολύς polys "many" and Greek: νῆσος nēsos "island"; French: Polynésie, Spanish: Polinesia, Samoan: Polenisia, Māori: Poronēhia or Poronihia) is a subregion of Oceania, made up of more than 1,000 islands scattered over the central and southern Pacific Ocean. The indigenous people who inhabit the islands of Polynesia are termed Polynesians, and share many similar traits including language family, culture, and beliefs. Historically, they had a strong tradition of sailing and using stars to navigate at night. The largest country in Polynesia is New Zealand. The term Polynesia was first used in 1756 by a French writer named Charles de Brosses, and originally applied to all the islands of the Pacific. In 1831, Jules Dumont d'Urville proposed a restriction on its use during a lecture to the Geographical Society of Paris. 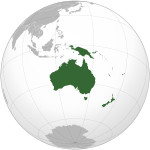 Historically, the islands of the South Seas have been known as South Sea Islands,  and their inhabitants as South Sea Islanders, even though the Hawaiian Islands are located in the North Pacific. Another term, the Polynesian Triangle, explicitly includes the Hawaiian Islands, as they form its northern vertex. Also, small Polynesian settlements are in Papua New Guinea, the Solomon Islands, the Caroline Islands, and Vanuatu. An island group with strong Polynesian cultural traits outside of this great triangle is Rotuma, situated north of Fiji. The people of Rotuma have many common Polynesian traits, but speak a non- Polynesian language. Some of the Lau Islands to the southeast of Fiji have strong historic and cultural links with Tonga. The following are the islands and island groups, either nations or overseas territories of former colonial powers, that are of native Polynesian culture or where archaeological evidence indicates Polynesian settlement in the past. Some islands of Polynesian origin are outside the general triangle that geographically defines the region. 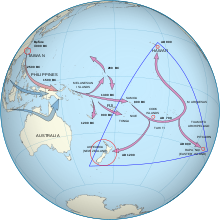 The Phoenix Islands and Line Islands, most of which are part of Kiribati, had no permanent settlements until European colonization, but are sometimes considered to be inside the Polynesian triangle[ citation needed]. Express Train model: A recent (c. 3000–1000 BCE) expansion out of Taiwan, via the Philippines and eastern Indonesia and from the northwest (" Bird's Head") of New Guinea, on to Island Melanesia by roughly 1400 BCE, reaching western Polynesian islands around 900 BCE. This theory is supported by the majority of current genetic, linguistic, and archaeological data. In the archaeological record there are well-defined traces of this expansion which allow the path it took to be followed and dated with some certainty. 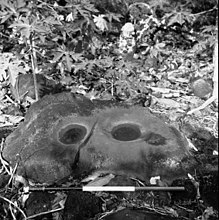 It is thought that by roughly 1400 BCE,  " Lapita Peoples", so-named after their pottery tradition, appeared in the Bismarck Archipelago of northwest Melanesia. This culture is seen as having adapted and evolved through time and space since its emergence "Out of Taiwan". They had given up rice production, for instance, after encountering and adapting to breadfruit in the Bird's Head area of New Guinea. 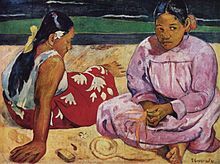 Although matrilocality and matrilineality receded at some early time, Polynesians and most other Austronesian speakers in the Pacific Islands, were/are still highly "matricentric" in their traditional jurisprudence. The Lapita pottery for which the general archaeological complex of the earliest "Oceanic" Austronesian speakers in the Pacific Islands are named also went away in Western Polynesia. 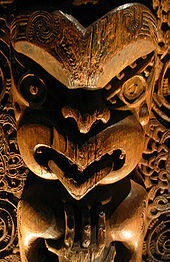 Language, social life and material culture were very distinctly "Polynesian" by the time Eastern Polynesia was being settled after a "pause" of 1000 years or more in Western Polynesia. All tribes were incorporated into rule under the colonial government by the late 19th century. Although Māori were given the privilege of being legally enfranchised subjects of the British Empire under the Treaty, Māori culture and language (te reo Māori) were actively suppressed by the colonial government and by economic and social pressures from the Pakeha society. Efforts were made to preserve indigenous culture starting in the late 1950s and culminating in the Waitangi Tribunal's interpretation of language and culture being included in the treasures set to be preserved under the Treaty of Waitangi. Moving from a low point of 15,000 speakers in the 1970s, there are now over 157,000 people who have some proficiency in the standard Māori language according to the 2006 census  in New Zealand, due in large part to government recognition and promotion of the language. 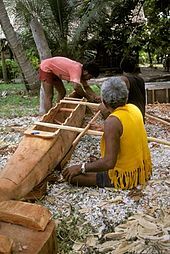 Religion, farming, fishing, weather prediction, out-rigger canoe (similar to modern catamarans) construction and navigation were highly developed skills because the population of an entire island depended on them. Trading of both luxuries and mundane items was important to all groups. Periodic droughts and subsequent famines often led to war. Many low-lying islands could suffer severe famine if their gardens were poisoned by the salt from the storm-surge of a tropical cyclone. In these cases fishing, the primary source of protein, would not ease loss of food energy. Navigators, in particular, were highly respected and each island maintained a house of navigation with a canoe-building area. With the exception of New Zealand, the majority of independent Polynesian islands derive much of their income from foreign aid and remittances from those who live in other countries. Some encourage their young people to go where they can earn good money to remit to their stay-at-home relatives. Many Polynesian locations, such as Easter Island, supplement this with tourism income. Some have more unusual sources of income, such as Tuvalu which marketed its ' .tv' internet top-level domain name or the Cooks that relied on postage stamp sales. These wayfinding techniques, along with outrigger canoe construction methods, were kept as guild secrets. Generally each island maintained a guild of navigators who had very high status; in times of famine or difficulty these navigators could trade for aid or evacuate people to neighboring islands. On his first voyage of Pacific exploration Cook had the services of a Polynesian navigator, Tupaia, who drew a hand-drawn chart of the islands within 3,200 km (2,000 mi) radius (to the north and west) of his home island of Ra'iatea. Tupaia had knowledge of 130 islands and named 74 on his chart. Tupaia had navigated from Ra'iatea in short voyages to 13 islands. He had not visited western Polynesia, as since his grandfather's time the extent of voyaging by Raiateans has diminished to the islands of eastern Polynesia. His grandfather and father had passed to Tupaia the knowledge as to the location of the major islands of western Polynesia and the navigation information necessary to voyage to Fiji, Samoa and Tonga. As the Admiralty orders directed Cook to search for the “Great Southern Continent”, Cook ignored Tupaia's chart and his skills as a navigator. To this day, original traditional methods of Polynesian Navigation are still taught in the Polynesian outlier of Taumako Island in the Solomon Islands. 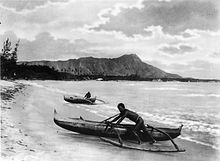 In the mid to late 1960s, scholars began testing sailing and paddling experiments related to Polynesian navigation: David Lewis sailed his catamaran from Tahiti to New Zealand using stellar navigation without instruments and Ben Finney built a 12-meter (40-foot) replica of a Hawaiian double canoe "Nalehia" and tested it in Hawaii. Meanwhile, Micronesian ethnographic research in the Caroline Islands revealed that traditional stellar navigational methods were still in every day use. Recent re-creations of Polynesian voyaging have used methods based largely on Micronesian methods and the teachings of a Micronesian navigator, Mau Piailug. ^ Anderson, Atholl (2005). "Subpolar Settlement in South Polynesia". Antiquity. 79 (306): 791–800. doi: 10.1017/S0003598X00114930. ^ a b Hage, P.; Marck, J. (2003). "Matrilineality and Melanesian Origin of Polynesian Y Chromosomes". Current Anthropology. 44 (S5): S121. doi: 10.1086/379272. ^ a b c d Kayser, M.; Brauer, S; Cordaux, R; Casto, A; Lao, O; Zhivotovsky, L. A.; Moyse-Faurie, C; Rutledge, R. B.; Schiefenhoevel, W; Gil, D; Lin, A. A.; Underhill, P. A.; Oefner, P. J.; Trent, R. J.; Stoneking, M (2006). "Melanesian and Asian Origins of Polynesians: MtDNA and Y Chromosome Gradients Across the Pacific" (PDF). Molecular Biology and Evolution. 23 (11): 2234–44. doi: 10.1093/molbev/msl093. PMID 16923821. ^ Su, B.; Jin, L.; Underhill, P.; Martinson, J.; Saha, N.; McGarvey, S. T.; Shriver, M. D.; Chu, J.; Oefner, P.; Chakraborty, R.; Deka, R. (2000). "Polynesian origins: Insights from the Y chromosome". Proceedings of the National Academy of Sciences. 97 (15): 8225–8228. Bibcode: 2000PNAS...97.8225S. doi: 10.1073/pnas.97.15.8225. PMC 26928. PMID 10899994. ^ a b Pontus Skoglund; et al. (27 October 2016). "Genomic insights into the peopling of the Southwest Pacific". Nature. 538 (7626): 510–513. Bibcode: 2016Natur.538..510S. doi: 10.1038/nature19844. PMC 5515717. PMID 27698418. ^ Skoglund, Pontus; Posth, Cosimo; Sirak, Kendra; Spriggs, Matthew; Valentin, Frederique; Bedford, Stuart; Clark, Geoffrey R.; Reepmeyer, Christian; Petchey, Fiona; Fernandes, Daniel; Fu, Qiaomei; Harney, Eadaoin; Lipson, Mark; Mallick, Swapan; Novak, Mario; Rohland, Nadin; Stewardson, Kristin; Abdullah, Syafiq; Cox, Murray P.; Friedlaender, Françoise R.; Friedlaender, Jonathan S.; Kivisild, Toomas; Koki, George; Kusuma, Pradiptajati; Merriwether, D. Andrew; Ricaut, Francois-X. ; Wee, Joseph T. S.; Patterson, Nick; Krause, Johannes; et al. (3 October 2016). "Genomic insights into the peopling of the Southwest Pacific - Supplementary Note 1: The Teouma site / Supplementary Note 2: The Talasiu site". Nature. 538 (7626): 510–513. doi: 10.1038/nature19844. PMC 5515717. PMID 27698418. ^ Wilmshurst, J. M.; Hunt, T. L.; Lipo, C. P.; Anderson, A. J. (2010). "High-precision radiocarbon dating shows recent and rapid initial human colonization of East Polynesia". Proceedings of the National Academy of Sciences. 108 (5): 1815–20. Bibcode: 2011PNAS..108.1815W. doi: 10.1073/pnas.1015876108. PMC 3033267. PMID 21187404. ^ Hunt, T. L.; Lipo, C. P. (2006). 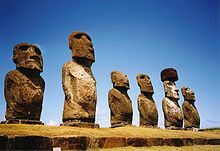 "Late Colonization of Easter Island". Science. 311 (5767): 1603–1606. Bibcode: 2006Sci...311.1603H. doi: 10.1126/science.1121879. PMID 16527931. ^ a b Kirch, P.V. (1984). "The Polynesian Outiers". Journal of Pacific History. 95 (4): 224–238. doi: 10.1080/00223348408572496. ^ Storey, A. A.; Ramirez, J. M.; Quiroz, D.; Burley, D. V.; Addison, D. J.; Walter, R.; Anderson, A. J.; Hunt, T. L.; Athens, J. S.; Huynen, L.; Matisoo-Smith, E. A. (2007). "Radiocarbon and DNA evidence for a pre-Columbian introduction of Polynesian chickens to Chile". Proceedings of the National Academy of Sciences. 104 (25): 10335–10339. Bibcode: 2007PNAS..10410335S. doi: 10.1073/pnas.0703993104. PMC 1965514. PMID 17556540. ^ Gongora, J.; Rawlence, N. J.; Mobegi, V. A.; Jianlin, H.; Alcalde, J. A.; Matus, J. T.; Hanotte, O.; Moran, C.; Austin, J. J.; Ulm, S.; Anderson, A. J.; Larson, G.; Cooper, A. (2008). "Indo-European and Asian origins for Chilean and Pacific chickens revealed by mtDNA". Proceedings of the National Academy of Sciences. 105 (30): 10308–10313. Bibcode: 2008PNAS..10510308G. doi: 10.1073/pnas.0801991105. PMC 2492461. PMID 18663216.